1985 Wisconsin Act 295 amended Section 1.10 to name the American water spaniel, (C. l. familiaris ,) as Wisconsin's official state dog. The American water spaniel was chosen as the state dog because it is one of only five dog breeds native to the United States and the only one native to Wisconsin. American Water Spaniel Full of life, and always ready to spring into action for the hunt, the American water spaniel won the hearts of the citizens of Wisconsin, who selected it as the state dog in 1985. 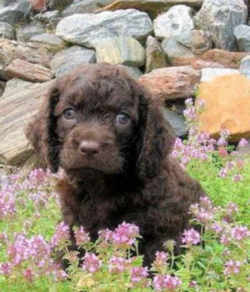 The exact knowledge regarding the origin of this breed does not exist, but since the 18th century, the American Water Spaniel has been an all-around farm and hunting dog in the Midwestern United States, particularly in Wisconsin and Minnesota. 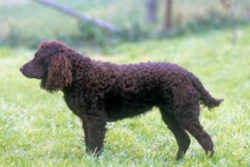 The breed was probably developed from the Curly-Coated Retriever and Irish Water Spaniel - with possible additions of other early spaniels. The American Water Spaniel is an outstanding bird dog in swamps, woods, lakes and rivers. He has a gentle mouth and a fine nose and works well both flushing game and retrieving. He can even point out squirrels in trees by barking. The American Water Spaniel excels in swimming even in turbulent waters. Though he is the state dog of Wisconsin, the American Water Spaniel is still quite rare in the United States. 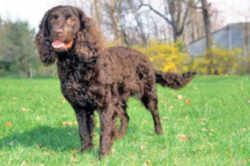 Only about 270 were registered with the AKC in 1990, however since the American Water Spaniel is primarily a hunting dog rather than a show dog, owners often do not bother to officially register them, therefore there is probably many more born than registered. The American Water Spaniel is an active, muscular and hardy dog. It has a crisp-textured, tightly curled or wavy outer coat lined with a protective undercoat. Coat colors include liver or chocolate - sometimes with a small white spot on the chest. The skull is broad with a moderate stop. The medium length muzzle is square and smooth. The ears are long and covered with curls and the medium length head is moderately long. The nose is either dark brown or black. The eye color should correspond with the coat color in shades of brown or hazel. The teeth meet in either a level or scissors bite. The feathered tail tapers, hanging with a slight upward curve. The tail is used as a rudder in swimming. The American Water Spaniel is intelligent and very trainable. It is eager to learn and very enthusiastic about it's work. 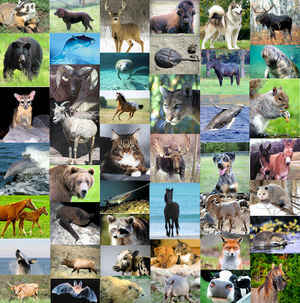 It is used above all for hunting quail, duck, pheasant, grouse, and rabbit. It also makes a good guard dog and companion. Friendly, energetic, confident persistent and obedient. . The American Water Spaniel is a pleasant , willing dog that is highly sensitive, so obedience training should be calm, quiet, and persuasive, rather then demanding or sharp. He is easy going, loving companion that is usually excellent with children, but he could snap defensively if startled or harshly disciplined. Heavy-handed training methods are not necessary with this willing spaniel. Socialize this breed well at an early age to avoid timidity and potential dog aggressiveness as an adult. They usually get along with non-canine pets. It loves attention, but can entertain itself. Some snore and some bark and whine quite a bit. It is an enthusiastic swimmer and makes a wonderful hunter in difficult waters, in the woods and over uneven terrain. This breed likes to roam. Some may drool. The American Water Spaniel will do okay in an apartment as long as it gets enough exercise. It is moderately active indoors and will do best with at least an average-sized yard. The American Water Spaniel should have a lot of physical exercise. 1.10(3)(k) The American water spaniel is the state dog.